Ok, maybe not that exciting to most, but I am thoroughly enjoying being able to eat pasta again, even if sauce is a bit tricky. If I’m honest, I did get some swelling and pain last night, but it could have been the stressful situation, it wasn’t necessarily the food. No, really! I’m re-testing pasta today, and if it goes well I get bread tomorrow. Bread! I can hardly believe it! Then, on to milk. I’m not particularly excited about milk, except that it is followed by butter and cheese, which I love. So, this week has been all about the food, if you hadn’t guessed. It’s starting to get exciting, as I begin to reach more normal ingredients. Her name isn’t finished (some outlining on April to complete, and her middle name to add), and her date of birth needs working in somewhere, then I’ll add a border. 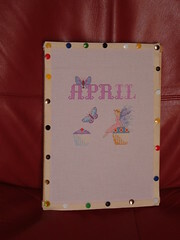 After that, probably more cross-stitch as lots more babies are on the way. Work has been busy, lots happening this week. On Tuesday I delivered an important training/presentation to some external people I’ll be working with lots in future. It went well, I think, lots of questions and discussion. Nerve-wracking though – I haven’t delivered a presentation in a year or two at least. On Weds my laptop packed up, kept trying to synch to a server which was de-commissioned on Tuesday. I hoped that taking it in to the office on Thursday would resolve that issue, but no, it got worse. IT support promised to get someone to me urgently, but no-one showed, despite the boss-man calling to harass them a bit. Now I’m hoping the proposed train strikes don’t go ahead this coming week, as I really need to get the poor broken laptop back in to Bristol on Tuesday in the hopes that a technician will show up. If the train strikes happen, I’m working at home all week, without a laptop! Last night we did a rare thing and voluntarily went out for a social family occasion, a party to celebrate A’s cousin’s 40th birthday. It was in Lechlade, so a bit of a distance to drive in the pouring rain in the dark, but worth it to show our faces. A’s Mum didn’t look so well, and has a nasty cough, I’m a bit worried about her. We’ve invited her round for Sunday dinner, but will have to check she’s well enough on the day. If needs be we’ll go to her house instead, make her soup, persuade her to rest for once. So, this coming week…I’m going out for lunch with my friend Caron. She heard recently that the baby she’s expecting is completely free from Spinal Muscular Atrophy, which her first baby died of. She does have a heart problem, but one which can be treated within her first two years, enabling her to live a normal, healthy life after that. Caron is over the moon, as SMA is a terrible illness with no treatment or cure, whereas the doctors are fairly confident they can fix the heart condition. Apart from that, business as usual (with added butter and cheese)! 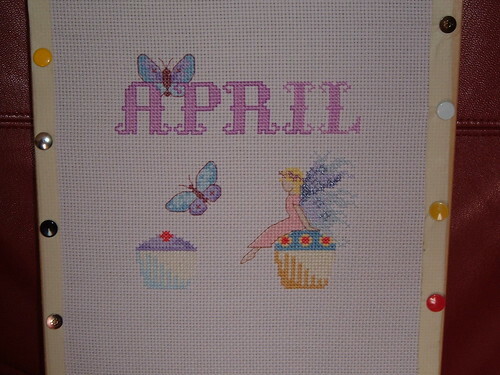 This entry was posted on April 3, 2010 at 9:46 am and is filed under Cross-Stitch, Family, Food, Work. You can follow any responses to this entry through the RSS 2.0 feed. You can leave a response, or trackback from your own site.